July 3, 2018 – Freedom For Humanity! Posted on July 3, 2018 by TheLightHasWonPosted in Environment & Health, Food & Health, Monsanto - Bayer - SyngentaTagged Agriculture, Alternative News, Awareness, Bayer, Biotech companies, Biotech giants, Cancer, Carcinogen, Consumers, Corrupt system, Environment, Environmental effects, FDA, Food additives, Foods, GE foods, Glyphosate, GMOs, Health, Herbicides, Human Health, Lawsuits, Lung cancer, Manipulated science, Monsanto, non-GMO food, non-Hodgkin lymphoma, Pesticides, Public Health, Roundup, Roundup Carcinogenicity, Toxic, Toxic chemical pollution, Trial, Weed Killer. Posted on July 3, 2018 by TheLightHasWonPosted in Channeled Messages, SpiritualityTagged Channeled Messages, Enlightment, Growth, Inspiration, knowledge of Self, Light, Love, Peace, Self-Discovery, Spirituality, the Creator, Uplifting, Wisdom. Posted on July 3, 2018 by TheLightHasWonPosted in Channeled Messages, SpiritualityTagged Archangel Gabriel, Channeled Messages, Enlightment, Inspiration, Light, Love, Peace, Spirituality, Uplifting, Wisdom. Posted on July 3, 2018 by TheLightHasWonPosted in Alternative News, Technology, UFOs - ExtraTerrestialsTagged Alternative News, Black budget, Disclosure, ExtraTerrestrials, Flying Objects, Governments, Hidden technology, Military, Military technology, Reverse Engineering Alien Technology, Science, Secrets, Space, Technology, UFO, UFO Phenomenon, UFO Technology, UFOs. Posted on July 3, 2018 by TheLightHasWonPosted in Alternative News, DisclosureTagged Alternative News, Alternative News, Awakening, Awareness, Cabal, Corey Goode, David Wilcock, Deep State, Disclosure, Economy, Emery Smith, ExtraTerrestrials, Freedom to Humanity, Hidden technology, History, Humanitys Awakening, Major disclosures, Media, Military, Peace, Planetary Liberation, Politics, President Trump, Prosperity, Science, Shadow Government, Spirituality, the Alliance, Trillions of dollars stolen, Whistleblowers. Posted on July 3, 2018 by TheLightHasWonPosted in Medicin & Hälsa, Medicine & HealthTagged Awareness, Body, Corruption, Disease, Drugs, Education, Förebyggande, Hälsa, Hälsosam kost, Hälsosam livsstil, Health, Healthy diet, Healthy Lifestyle, Holistic alternatives, Holistiska alternativ, Illness, Immune System, ImmunSystemet, Korruption, Kropp, Läkemedel, Mainstream medicine, Medical Industry, Medications, Medicin, Mediciner, Medicinsk industrin, Medvetenhet, Modern Medicine Failure, Moderna medicinens misslyckande, Natural alternatives, Naturliga alternativ, Näring, Nutrition, Prevention, Profit, Sjukdom, Utbildning, Vinst. We have the pleasure of watching over you as you discover the gifts that you have and the gifts that you share with the rest of humanity. It is so important that you share your gifts because when you do, you grant yourselves more access to those gifts. You allow more energy to flow through you when you give the energy that you access somewhere to go. Your gifts are blossoming now because the energies that you receive are holding such a high frequency. You couldn’t possibly hold them back at this point. The experience of your gifts coming to you can be challenging at times because you don’t know whether what you are seeing is the result of something going wrong with your physical body or whether it’s because you are accessing more of your clairvoyance. Sometimes the downloads and upgrades that you receive cause discomfort and even pain in your physical bodies. These are ascension symptoms, and the best thing you can do when you are needing to slow down and give your body a chance to rest and recuperate is to listen to what is going on in your physical body and give it the rest that it needs. 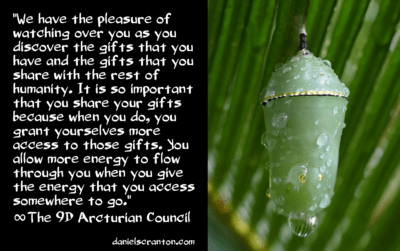 Awakening these gifts means that you are accessing past life versions of yourself as well, and that can mean other experiences, some of which are pleasant and some of which are not so pleasant. So as you access your gift of channeling or your psychic gifts, you may also access the trauma that you experienced when some authority figure, some member of a ruling class decided that he or she didn’t like what you were seeing or what you were saying. You have all been traumatized one way or another as a result of having gifts that others did not. So at times you are going to have to deal with that as well. You are also going to have to deal with being different, from looking different, from sounding different. But the more of you who step up and share your gifts, the more of you there are, and the more of you there are, the less weird it seems when someone comes along and starts speaking a light language or when someone is seeing things or hearing things that no one else is. It’s time to embrace those gifts and embrace the fact that those of you who are awakened are on the leading edge. You are on that track to ascend ahead of the rest of the collective, and it’s time to stand tall and proud and share your gifts with the world. Posted on July 3, 2018 by TheLightHasWonPosted in Channeled Messages, SpiritualityTagged Arcturian Council, Ascension, Ascension Symptoms, Awakening, Channeled Messages, Downloads, Energies, Enlightment, High frequency, Inspiration, Light, Love, Peace, Share your gifts, Spirituality, Upgrades, Uplifting, Wisdom.